Welcome to Duck Creek Farms - growing quality tomato and bedding plants for over 30 years. We cannot ship plants ordered from the retail section to Arkansas, Florida, Mississippi, South Carolina, Alaska or Hawaii. We do not ship outside the United States. Shipping begins Mid/Late April through June depending on the weather and crop timing. If a variety becomes unavailable we will substitute for a different variety. Please suggest acceptable substitutes or we may add more of the same variety. We will try to ship at the requested date, but may be delayed during peak season. If you do not indicate “no substitutions” we will substitute if a variety becomes unavailable. We take Checks or US Postal Money orders only or you can purchase online using our PayPal button options with payments payable to DuckCreekFarms@aol.com. Shipments will ship by UPS and in some rare cases by Priority mail. All shipments West of the Rocky Mountains will be by USPS Priority Mail. Please check The Availability and Updates to the website. Please click a link below to review our produce. We offer the following varieties at wholesale for large growers. Minimum shipment order is 500 slips with 50 per variety. Let us know which varieties and numbers you want in the field below once you select your quantities to order. You can also print off a Wholesale Order Form and mail in with a check. Also let us know your preferred shipping date. These are shipped UPS and some rare cases USPS . We do not ship outside the United States. We can not ship to Arizona or California. We do not ship to Hawaii or Alaska. Shipping usually begins the last week of April depending on weather and availability. Some varieties are in very limited supply and we will contact you if we need to amend your order. Please select a quantity from the drop down menu below. Please list the varieties you would like to include in your order in the field below, a minimum of 50 slips per variety. Below are the varieties available for wholesale. Please list the varieties above with your order. Varieties must be ordered in a minimum of 50 slips per variety. List slip varieties below in a minimum of 50 slips per variety, in multiples of 50 only. Red-Orange skin, orange flesh. 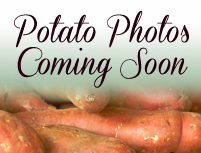 Thin stalks, vigorous grower, good producer, fat & heavy sweet potatoes. A typical "yam" type you find in stores. Has pox and nematode resistance. Very dependable producer with a very loyal following. Early production. Mid-season. Regular leaf, yellow-orange skin and flesh. Needs long season to do well. Bush type, great for smaller gardens. Roots short, blocky with rosy skin. Flesh medium orange. Roots have good table quality. Leaves deeply cut, dark green with a purplish tinge. Increased yields and superior root shape in heavy soils. More resistance to fusarium wilt and southern root knot than Centennial. to Jewel in University trials. Yield similar to Beauregard for the U.S. #1 and canner grades and slightly higher for jumbo grades. Harvest dates typically 3-5 days earlier than Beauregard. Roots store well without excessive weight loss from storage rots or dehydration. 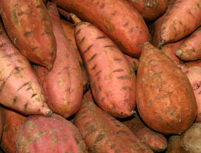 Baked roots have uniform color, and moist smooth flesh, and good flavor. Slow to sprout so don’t expect early shipment. Mid-season Vigorous vines, orange skin, dark orange flesh. Very moist when cooked, above average yields. This was one of our best producers in 2010. Mid-season. Semi-bush, greenish colored normal leaves, above average yields, tends to produce medium sized roots regardless of the season length. Has light orange skin with light orange flesh, Sweet, Moist flesh. Early maturity. Vining growth habit, dark green leaves, purple skin, with sweet, white flesh, good yields. Eating quality superior. Flesh color apricot. Skin color copper. Average yields. One of the most recognized and popular varieties. Mid to late season production. Purple fleshed with dark purple skin. Flavor is typical to the other purple fleshed varieties, which is not real sweet. Vining growth with early to mid-season production. We believe this is also being sold as “All Purple” and “Purple Passion”. Mid-season. Vining, regular leaf, cream skin, white flesh, average yields.